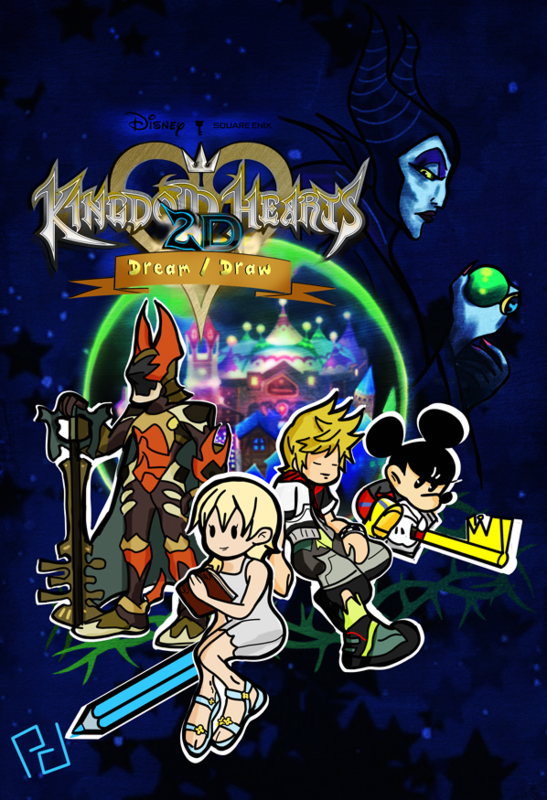 Audo goaded me into thinking about a KH fangame that's essentially a Paper Mario-esque side scroller taking place in Namine's sketch pad. Super adorable Tinny! I love how cute they are. Omg! This looks reallly GOOD! I'm no artist, I'm a programmer. I would love to have this conversation with you. Now. Having posted that, I appreciate people wanting to get involved! Though, again, this isn't an actual game. I mean, maybe with the right team it could be, when I have the time to devote to such a thing. I wouldn't be against it. Until that day comes, I'm just having fun doing concept art. The concept art is absolutely breathtaking. This is meant for a game? 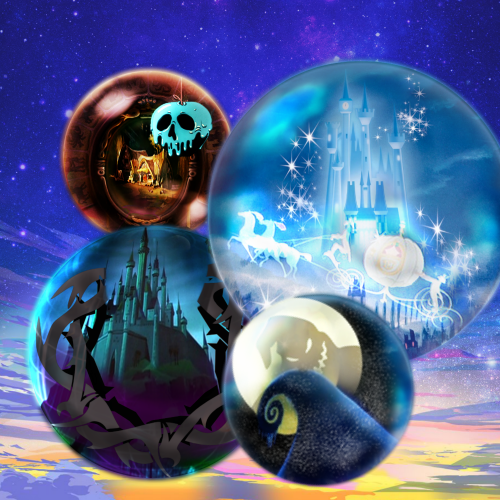 :O I would wanna play it for the visual art alone because, it's so beautiful and pretty. I love the first picture you posted. 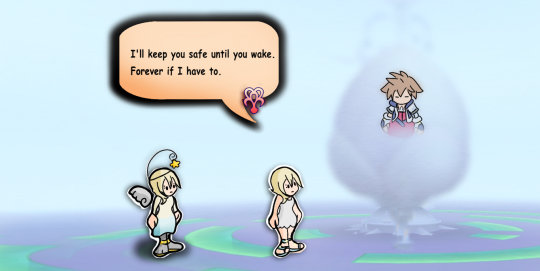 And Namine is freaking adorable. She's so cute. 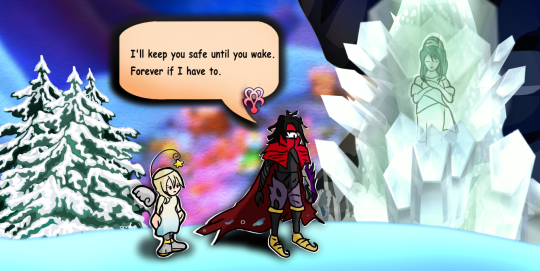 And I found it pretty hilarious how every character thus far says, "I'll keep you safe until you wake. Forever if I have to." It fits all of them so well. 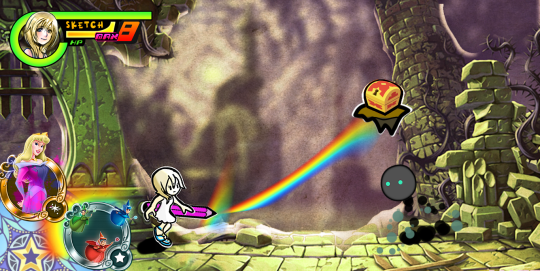 It's just a fun "What if" I'm so tempted to look into making something, but to develop a full game. Mmm. I'm not sure if I'd want to dedicate the time to something I don't own outright, you know? Maybe once the winter holidays roll around. Anyway, here's the pause menu that shows off the battle mechanic. 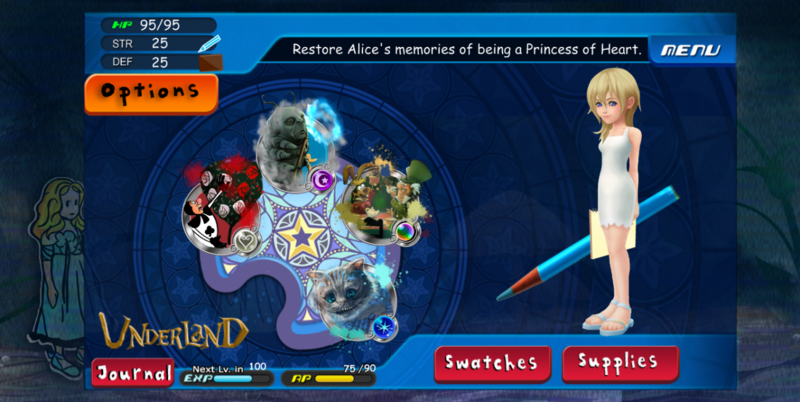 Similar to UX, but instead of a deck or medals, Namine implements Disney-based paint swatches on a palette to change her environment and battle enemies. Oh my I love this, I like the style and the concept. 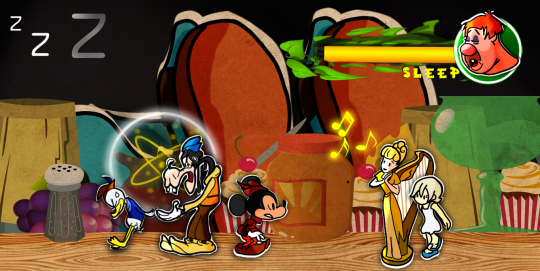 This is totally like Paper Mario but with Kingdom Hearts instend, very creative with the concept art. 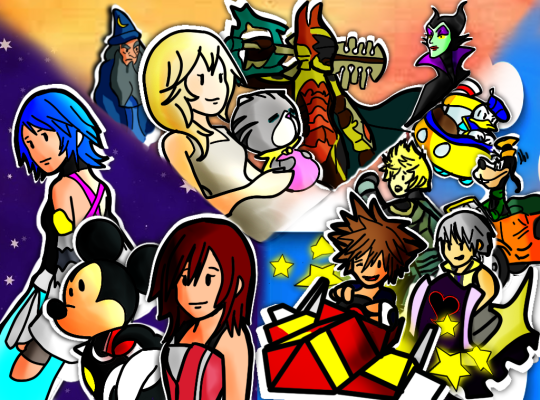 Ooh man, the ones with Vincent, Aqua and Ventus and Sora and Namine.... you know how to hit to the feels. And I loved how you used a static/distorted screen to transit from Vincent to KH's own characters in a similar situation. 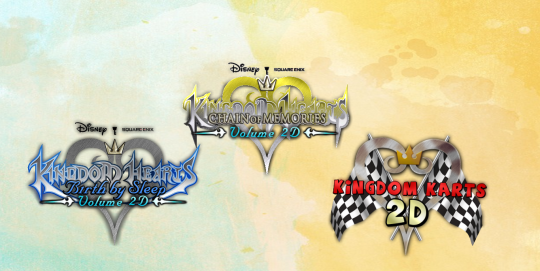 That is very KH-like to me. I would suggest taking this concept and creating your own IP with it. I'm a testament that developers will jump at the chance at working with you. Your art is gorgeous. There's a whole group of developers on facebook you should check out. 60,000 of them. Show off your art and you're bound to get noticed. Just type indie game devs, you'll find it. I like seeing Maleficent in the background, she looks so ominous. Aw thank you so much! I'm having a lot of fun doing VisDev for this. I'm happy with how she came out too! Thank you. 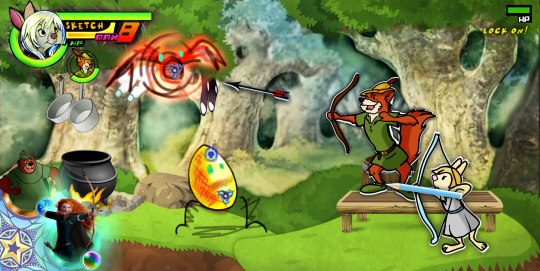 Here are some new pieces, a Robin Hood world and a new world called Spire City. Spire City looks really pretty and colorful. I really like the planet and stars, cause it really brings it together! The mosaic parts of what looks like buildings is really beautiful too. <3 I like colorful worlds a lot. And I imagine in Robin Hood's world, those two characters at the bottom would be summons? Or would they become party members too? I think its neat seeing that world be featured too! Oh and you're welcome. I like seeing what you're making! 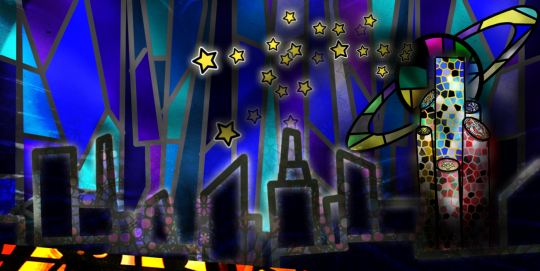 Spire City looks really pretty and colorful. I really like the planet and stars, cause it really brings it together! The mosaic parts of what looks like buildings is really beautiful too. <3 I like colorful worlds a lot. And I imagine in Robin Hood's world, those two characters at the bottom would be summons? 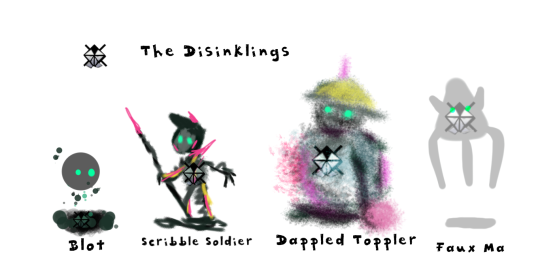 Or would they become party members too? I think its neat seeing that world be featured too! Oh and you're welcome. I like seeing what you're making! 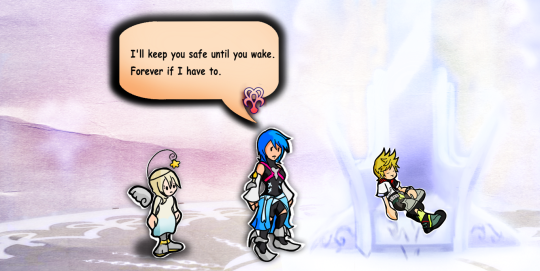 It's kind of like a mix between the medal system from Unchained X and the D-Link system from BBS where each swatch allows Namine to channel the power of a character. 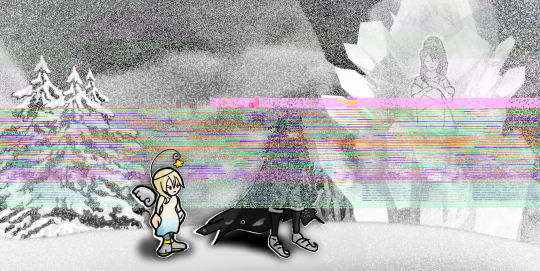 In the earlier screenshots there's a concept of Namine using a swatch of the three good fairies and that allows her to summon a rainbow bridge like the fairies do in the movie. Here, she's using Merida's swatch to turn her supplies into an arrow.